Preheat the oven to 325ºF. Line a baking sheet with parchment or a silicone mat. 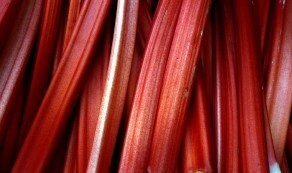 In a medium-size bowl, toss the sliced rhubarb with 3 tablespoons of the sugar and the lemon zest. Let sit. In a large bowl, whisk together the almond flour, flaxseed meal, remaining sugar, baking powder, and salt. Stir in the eggs and melted butter until the dough begins to come together. Add the rhubarb mixture and stir until evenly combined. Turn the dough onto a floured surface, shape it into a rectangle approximately 6 inches wide, 8 inches long and 1 inch thick. Cut the dough into 6 squares using a sharp knife. Then cut each square diagonally into 2 triangles. Distribute the scones on a lined baking sheet so they don’t touch. Bake them 25 to 28 minutes, or until they’re golden brown and just firm to the touch. In a small bowl, combine sugar, cinnamon, and ginger. Lightly sprinkle the mixture over the hot scones and let sit 15 minutes.